Kensho Watanabe bounded onto the stage Saturday at the NovaCare Complex’s practice bubble wearing a Carson Wentz No. 11 T-shirt and he got down to business after a moment of Eagles talk to a crowd of 1,400 invited guests. For the next hour, Watanabe led The Philadelphia Orchestra through a spectacular performance that ended with the Eagles Fight Song, Fly, Eagles Fly, and a standing E-A-G-L-E-S, Eagles ovation. This was a special day and first-one-of-a-kind event for the Eagles and for The Philadelphia Orchestra providing a sensory-free concert and for the autism community to embrace the power of love and inclusion. 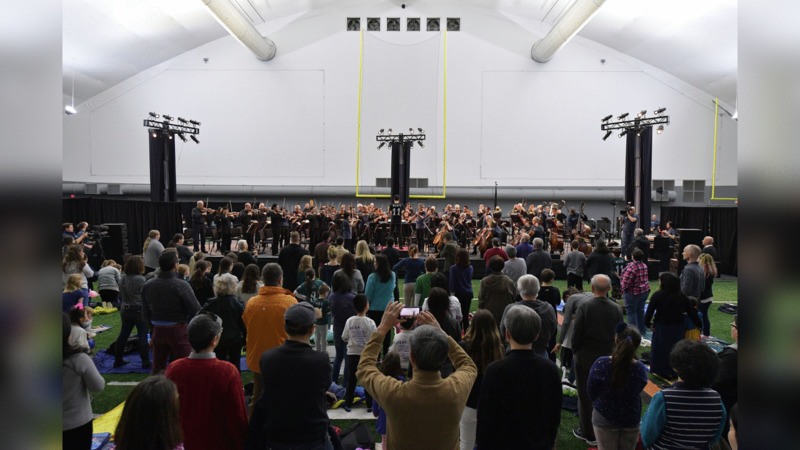 The Philadelphia Orchestra performance capped an afternoon of activities for families who came as the Eagles reached out to the local community, autism organizations, and the entire Eagles Autism Challenge community. Before the kids and parents spread their blankets or just sat in the “no-shush zone” of the 70-yard practice bubble, there were stations for balloon making, face painting, information stations, and everything to accommodate every need, including a sensory room, fidget toys, noise-canceling headphones, and plenty of room to take a break. It worked out absolutely perfectly as the reach of the Eagles Autism Challenge – which is far more than a one-off event for the Eagles; it’s a way of life – continued to grow. “It is incredible to share the day with such a diverse group – old, young, and everyone between. To be able to celebrate the autism community and to let them know that there is a place for them is what makes this so special,” Hammond said. “Eagles Autism Challenge has been a driver for us to really have a movement on inclusion. If you think about our stadium, we now have sensory bags at all of our guest services areas. We converted areas into sensory spaces for breaks during games. We worked during our public (Training Camp) practices last year to have suites available for families. Knowing that the unexpected is challenging for them, we want to provide the support necessary to share experiences successfully with all our fans. “It’s really woven into the fabric of what we’re doing. 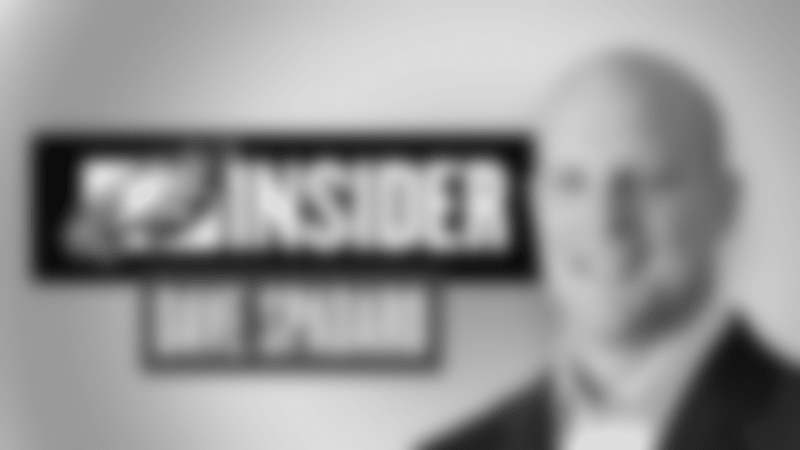 Culture change happens quickly when it comes from Jeffrey Lurie’s leadership and vision. People see that autism inclusion is important to him and the entire Eagles organization has bought in and I think it’s helping us inspire other organizations like the orchestra to make autism inclusion a priority. We’ll see this become even more far-reaching as we work to become a model for other organizations that strive for neurodiversity." Last spring’s Eagles Autism Challenge raised more than $2.5 million, which was recently invested into three founding beneficiaries – Children’s Hospital of Philadelphia (CHOP), Drexel University, and Thomas Jefferson University and Jefferson Health – and funded eight projects between those three institutions that are all related to autism research in basic science and clinical research and also some programmatic support. That financial support came from 3,300 participants and 25,000 donors from 40 countries. Hammond said the Eagles are tracking ahead of last year’s pace, but there is so much more work to do. “This is just the start. Our signature event is the fundraiser, which is where we can bring people together, but it’s what we do between events that shows the authenticity of our commitment to the autism community,” she said. “We want people to join the movement to really inspire inclusion in everything we do as an organization. The concert on Saturday was magical. The Philadelphia Orchestra opened with Bizet “The Torreadors,” from Suite 1 of Carmen and played eight pieces in all, including Beethoven from Symphony No. 5 in C minor, Op. 67: I. Allegro con brio, and Tchaikovsky Capriccio Italien, Op. 45. You know, the classics. It was absolutely beautiful, with the acoustics in the practice bubble so perfect as the Eagles and The Philadelphia Orchestra collaborated, sort of, a second time. You might remember the performance last summer at the Mann Music Center as The Philadelphia Orchestra played NFL Films music, with an assist from Jason Kelce, celebrating the Super Bowl LII victory. This time, the crowd was new, but the music was just as moving and the sound was crisp. “That was our biggest fear,” said Mike Albaugh, the Philadelphia Orchestra’s director of collaborative learning. “When I first suggested this idea, we wondered, ‘Well, what’s it going to sound like?’ So we took a walk through and David, our sound guy, was like, ‘I think we can make it work.’ Basically, I haven’t slept since that day, but it sure sounds great. The music ended with Fly, Eagles Fly, the Eagles Fight Song, of course, and the crowd responded and the musicians took their bows and families walked toward the exits smiling, knowing just how much impact Eagles Autism Challenge has every day of the year. Said Scott Paymer, who attended with his wife and three children: It was an afternoon of face painting, balloon making and moon bounce jumping with a community of kind people. The ability to bring the Philadelphia Orchestra to kids, allowing them to enjoy it in a relaxed setting, was really awesome. It was a truly special event and we feel lucky to have been there." The concert ended with an orchestral rendition of "Fly, Eagles, Fly"